Coriander leaves chopped fine to garnish. Grind onions and green chili into a fine paste. Keep aside. Next grind tomatoes into fine paste and keep aside. 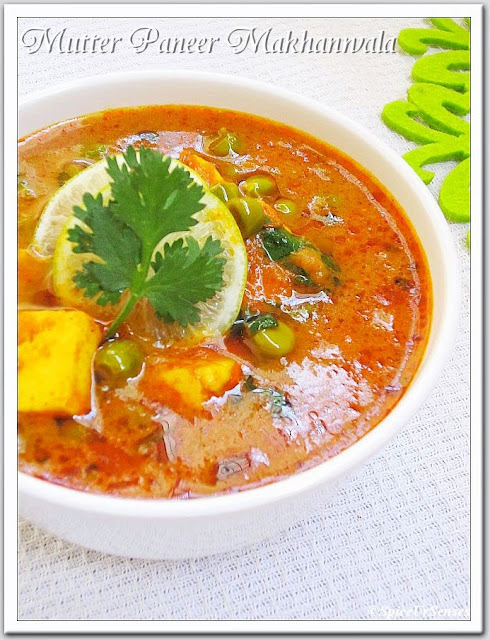 Heat 2tsp of butter in a pan and gently stir-fry the cubes of paneer till lite golden. Remove onto a paper towel and keep aside. In the same vessel heat 3tsp of butter and add the cinnamon, cloves, cardamom and onion paste. Fry till it turns light brown. Add tomato paste, ginger and garlic paste and fry for another 2minutes. Add the red chilli, coriander, turmeric and garam masala powders, stirring continuously till the oil begins to separate from the masala. Add the peas to the masala and fry for 2-3 minutes. Then add the paneer, water and salt, reduce flame to a simmer and cook till the gravy thickens. Garnish with coriander leaves and left over butter and serve. 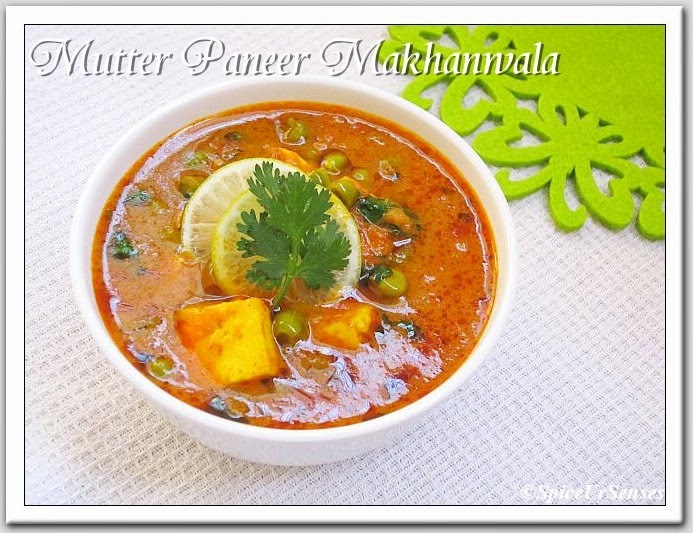 Mutter paneer Makhanwala tastes great with parathas, naans and even jeera rice. It has come out so well.. loved it. Awesome gravy...looks very tempting...mouth watering..Rumana. Healthy and tasty, thank you! 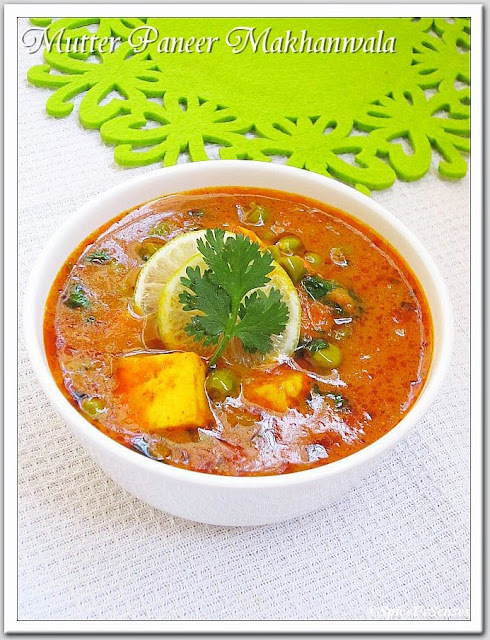 Delicious and lovely looking paneer preparation. Give me that bowl, u dont worry about rotis, i can make some..Wat a catchy mutter paneer gal. Curry looks very buttery and appetizing. and you said it right, to make any dish perfect, one should use right proportion of ingredients. Very tempting n haters of paneer also vl try this if they see this pics. This is amazing! 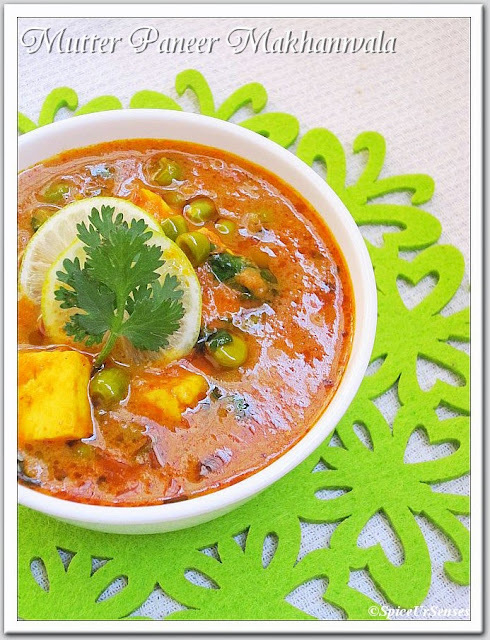 I am a big fan of paneer! I wil try to make this but wit much less butter.. Thanks for the recipe..